Milford, NJ, September 17, 2018 --(PR.com)-- Global Healthcare Management is hosting their 5th Annual Kids Fun Run at Alexandria Park in Milford, NJ. 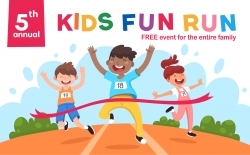 This free event, sponsored by Global Healthcare’s CEO, Jon Paul Letko, is open to all families in the community and aims at getting kids excited about exercise and physical activity. The Fun Run is a one or two mile run around beautiful Alexandria Park in Milford, NJ. Following the run, there will be activities and games for all. DJ Sean Moyer will be providing musical entertainment, while the kids can play games, win tickets for prizes, and enjoy face painting by Brushed with Love from Stroudsburg, PA. In addition, the event is adding something new this year - a 70 foot blow up obstacle course. The Kid’s Fun Run is on October 13, 2018 at Alexandria Park, Milford, NJ. The rain date is October 14th. Registration begins at 10 AM and the race starts at 10:30 AM. Global Healthcare Management’s employees volunteer their time every year for this event. “I am so proud of my staff for coordinating and volunteering their time and energy to make this event possible, year after year. All of us at Global Healthcare invite families to come out and join us at the fun run this year.” To register for this family-friendly free event, please visit ghcm.com/kidsfunrun.